This has been a rather low-key week. Parent-Teacher conferences on Wednesday meant fewer lesson plans to create, but resulted in sheer exhaustion at the end of the day. I saw a different family every fifteen minutes from 8:00AM until 3:30PM, and while it is always nice to put a parental face with a student’s name, meeting so many new people is wearisome for an introvert like myself. While I was not in class much this week, I did manage to have quite a bit of grading to accomplish. I try to balance my grading schedule so that I am not overwhelmed, but somehow this week I had two different classes turn in rather extensive papers. In an effort to follow my year-long mantra “Work Smarter, not Harder” I am trying to grade a few papers every day rather than all of them at once. So far I have stayed on task. As is my typical fashion, when I have an idea I tend to zoom full speed ahead. Such is the situation with NaNoWriMo. Not only have I decided to attempt this challenge myself, but I have solicited interest among my students. I have organized an extracurricular “club” where these budding novelists can come and share ideas, frustrations, and successes. So far about ten students have registered and I am thrilled! Students do not need to write the required adult goal of 50,000 words, but they do need to settle on a word count that would be a true challenge for them. I envision us meeting about once a week in person and then online in a discussion board forum. This will certainly put the pressure on me to strive to complete the challenge – as I will have my own students constantly inquiring about my progress. See what I mean? I zoom full speed ahead without thinking of all the possible consequences. I have continued the focus of my NaNoWriMo read-athon weekend to extend through this week. I quickly skimmed the book, This is the Year You Write Your Novel by Walter Mosley. Vivienne mentioned this little book on her blog and I thought it would be worth a quick glance prior to the month of November. Since I have read several books on this topic over the past few months, there was not a wealth of new information here, but it was a good summary of the key elements. I still know that my biggest struggle (besides the fact that the mushy middle is not at all fleshed out) is that inner critic that will want to examine every punctuation mark and search for just the right word. 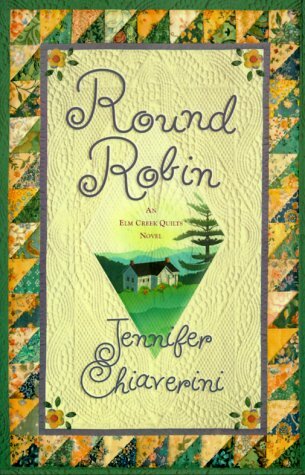 I also started reading Round Robin, the second book in the Elm Creek Quilt novel series by Jennifer Chiaverini. I picked up this book as “research” for my own novel. My NaNoWriMo book will focus on female relationships, in particular the sandwich generation of the protagonist being the caregiver for her two daughters as well as of her own mother. The stress of dealing with these domestic issues causes her to reach out to a former circle of girlfriends called the Stitch Group. Since Round Robin also focuses on female relationships in the context of quilting friends, I thought it would be a great place to start. The book is structured in much the same way I envision for my story, and I am learning how to develop character stories in the midst of the overriding narrative. It is funny. My literary interests lie in suspense/thriller or literary fiction – but I find myself drawn to writing “chick lit” — a genre that I have never desired to read. At first I was confused. Why would I not be inspired to write a book that I enjoy reading? Why am I motivated to write a book that I would typically ignore? But as I read this quilt series (yes, I do plan to read others) I have discovered that chick lit (at least as it is defined by this book) is MY life. I read to escape – so why would I choose to read a story about the life that I want to temporarily flee? But the old adage – write what you know – is true. This is my life – all the bumps, twists and turns, and there is story here that I need to tell. Not that I need anyone else to read — I just need to narrate. I am hopeful that once I get this story in writing – I will be free to explore other creative writing adventures. The weather here in Kansas has seen a slight warm-up – so while many of you are writing about cooler autumn temperatures, we are experiencing a sunny weekend with temperature in the mid-80s. I am now ready to say good-bye to these summer days and welcome more seasonal weather. I did take advantage of the sunshine, however, and went to the park to take some photographs. The leaves are still not at peak color in the Midwest – I am guessing maybe next weekend would be better – but I still enjoyed walking in the sunshine and watching families picnic at the water’s edge and fly kites in the grassy plains. In reading through the blogs this morning, I was inspired by two particular posts. One post came from the Shutter Sisters where the day’s photographic theme is: What I need Now. Their selected photograph is a simple mug of hot tea. I haven’t decided how I might capture “what I need now” in a photograph, but I think it is a thought-provoking assignment. What would your photo be? Another post that caused me to pause and ponder can be found at Sunday Scribblings where the week’s topic is simply Harvest. As a teacher I live my life in the planting season. I desire fertile soil to plant the seeds of knowledge. Some of the students come to my class with a thirst for learning: their parents have prepared them well and they are ripe for planting. Some students need a little more work: perhaps a bit more encouragement, as they have already experienced one too many failures in their short academic career while others need more discipline as they have not yet discerned how to manage the priorities of life (delayed gratification has not yet entered their vocabulary). A teacher’s planting season is but 9 months, while the harvest season does not come for several years. If we are lucky we might see the sprout of knowledge by May, but more often than not, the true harvest is not realized until after graduation – long after our diligence is passed. Sometimes this can be discouraging. The harvest makes the hard work of planting and maintenance worthwhile. When you miss out on the harvest, it is difficult to remember that the sacrificial work and intense frustrations of sowing are ever appreciated. But sometimes, every once in a while, a former student will take the time to come back and say hi and give me a glimpse of the harvest. When they return as successful college students or career-minded graduates, it is rewarding to know that the seeds have indeed sprouted, grown, flourished and will now be shared with the next generation. It is nice to hear that the high expectations that I set in class have helped them to achieve their personal goals in life. And somehow this small glimpse of the harvest motivates me to return to the classroom with a renewed spirit that will carry me until the next time. I love the analogy comparing teaching to the planting season. It would be wonderful if all teachers and parents felt that way. Have a great week, Molly! Is one allowed to start the NaNoWriMo project before November. 50,000 words is so many that I'd get moving now myself. I'm glad that you are doing great on the writing project. I realized that I should have bookmarked the books you have read for this along with your reviews. I'll get back to it some time. I've been wanting to write for quite a while now, but never quite getting the time, so I like you way of reading a few first then dabbling with the pen. Have a great week! As bermudaonion says, the harvest is a beautiful analogy. It reminds me of the work I did, too, and while the three decades of working with dysfunctional families had few overall rewards, my last three years were spent working closely with emotionally fragile teens. I saw some of them bloom and come back to visit (usually in the home of a former foster parent; I keep in touch with some of those), and it is gratifying to see them going to college and establishing independent lives. A harvest, in a way. I can relate to what you said about an introvert forced into regular and intense contact with people. I, too, struggled with the discomfort of this over the years; knocking on doors and facing total strangers to address difficult issues. It got easier, but it was always a bit outside my comfort zone. I am more completely happy reading, blogging, and writing. I think I'll give NaNoWriMo a stab. I've been writing down some ideas, since I can't do my current WIP (it's in the editing phase). Click my name for the link…. So cool that some of your students are doing NaNoWriMo as well. It will generate energy among you, as you will be each other's cheerleaders–you will all go farther as a group than any of you would have, alone. Love what you had to say about living your life in the planting season Molly. It makes lots of sense. Wishing you a stress free week. I hope things have settled down with your mom as well. Having students take part in your November writing project is such a good idea. A support group in a way, sort of like Game On. And I am ruminating on "what I need now". I think maybe sleep. Or wine. Really love your harvest analogy, Molly. It's very beautiful. I'm starting to get excited about NaNoWriMo, although I keep flip flopping back and forth about what project(s) I'll be working on. The only thing I do know for sure is that no matter what, it will be fun. I think it is brilliant that you have some of your students joining in. They will definitely keep you writing. Thank you for the mention. The book definitely provided a summary but not a lot else. Send that inner editor to me and I will lock him up in the cupboard under the stairs. I still haven't fleshed my idea out completely and hope to dedicate a day to it this week. You talk about teaching in such a lovely way. Some days I want to go in and use a giant fire-hydrant water hose and just tell them to DRINK! 🙂 Your patience and diligence shows in your posts. I've been a bit over my head with end of term grades coming up and a new grading system that has us all screaming. Thankfully, parent-teacher conferences were weeks ago, so I'm at least rejuvenated from that. I'm new to your blog and had no idea what NaNoWriMo is, so I followed the link you provided – wow, that's ambitious! Exciting as well as fun. Good luck with it! Molly, my dad taught high school for 38 years. Fifteen years ago he retired. Nearly every month he either sees a student or hears from a student who talks about the influence he had in their lives. Your harvest may be difficult to imagine at this point but know that it will continue for the rest of your life. Good luck with NaNoWriMo! I'm not going to do it this year, but I was looking at the forums and I see that most of the people in my local group are college and high school students. That's great that you got some of your students to try it! That is neat that you got your students involved in the NaNoWriMo … but it does mean you need to produce too! I almost missed your post today. I've grown to look forward to hearing about your week, you teaching, your writing and adventures, Molly. It is a good way to start my week. 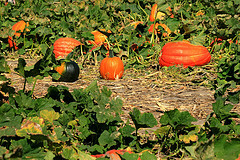 I love you analogy of teaching to planting and your photograph is resplendent with the colors of fall. We had some of the heat you are experiencing last week. I think the warm nights are the reason we are not yet at peak yet. We have finally cooled in Illinois and Tom and I have been taking long walks. Enjoy. Good luck with your writing. How cool to get students involved. I've been meaning to read the Elm Creek books. Good luck with your writing next month! I read the first Elm Creek Quilt novel several year ago and enjoyed it quite a bit. What a wonderful post Molly. You are an inspiration. Love the 'growing season' analogy. I'd like to be a student in your class. How neat that you were able to organize several students into a Nano group! I hope that all my blogger writing friends have a wonderful November (how is it already here??). I've heard other writers say that their reading and writing don't necessarily mesh together–very interesting thought! Great post. I'm glad the NaNo folks are encouraging young writers. I've participated the last couple years and it's been a great experience. The encouraging e-mails from authors are invaluable.